Lot 745. A rare Longquan celadon Guan-type tripod censer, Southern Song dynasty (1127-1279); 5 3/8 in. (13.6 cm.) diam. Estimate $100,000 - USD 150,000. Price Realized $173,000. © Christie’s Image Ltd 2014. The censer has a compressed body, upright neck and everted rim and is applied with three ribs of slip that extend down the sides from the edge of the shoulder to the bottom of each leg. The vessel is covered allover in a crackle-suffused glaze of beige-celadon color that thins on the ribs, Japanese wood box, wood cover. Note: This Longquan tripod censer assumes the form of a Shang- or Zhou-dynasty liding cauldron, a bronze vessel that in antiquity was used to boil millet for use in ceremonies honoring the spirits of deceased ancestors. In both early bronzes and later ceramics, the tri-lobed bodies of such liding-form vessels resolve themselves in a circular neck and lip, as seen in this fine example. The association of later ceramics with Bronze Age antiquities came about as the literati, following the lead of the Imperial Court, began to collect ancient bronzes and jades during the Northern Song period. On rare occasions, when learned friends of taste and sophistication would gather for an afternoon of poetry, painting, and collection viewing, a collector might press several of his collected antiquities into service as vases and censers, using an ancient bronze gu or zun wine vessel as a flower vase, for example, and an ancient bronze ding or liding cooking vessel or a gui food-serving vessel as a censer. The collectors and their guests knew that in antiquity such bronzes were used as vessels for food and wine in funerary ceremonies, but they nevertheless repurposed them to serve their own needs and tastes. However, realizing that too frequent use would damage, or even ruin, their collected antiquities, such collectors began to rely on related pieces made in ceramic ware, thereby giving rise to the tradition of censers and vases in the shape of ancient bronzes. The form, glaze, and dove-grey stoneware body indicate that this censer was made at the Longquan kilns during the Southern Song period. Fired in an oxygen-deprived, reducing atmosphere, the exposed body clay at the bottom of the feet has fired russet brown, a notable characteristic of wares produced at the Longquan kilns. Standard Southern Song Longquan wares typically feature thick, semi-opaque glazes of cool, bluish-green hue over dove-grey stoneware bodies. The jade-like glaze's semi-opacity results from the presence of numerous tiny bubbles and particle inclusions. Most Longquan celadons are unornamented, relying on precisely defined forms and perfectly hued glazes for aesthetic appeal. In that context, the Longquan potters definitely took their aesthetic cues from aristocratic wares made at the Guan kilns. 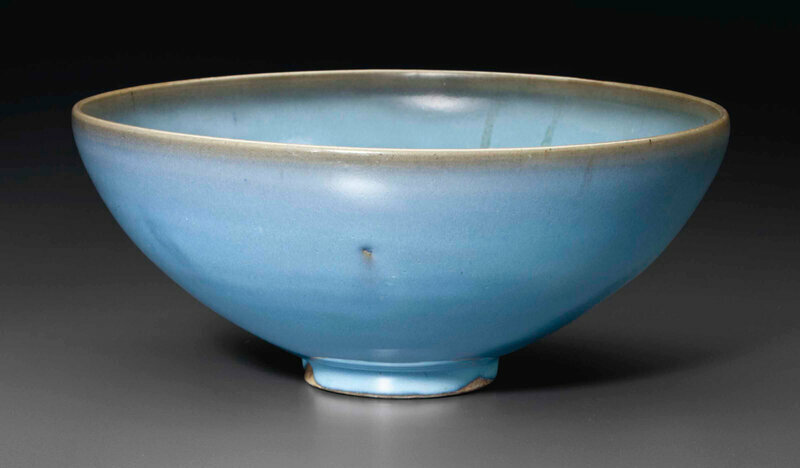 Although the glazes of most Longquan celadon wares exhibit a cool, bluish-green hue and lack craquelure, fine crackled wares were also made at the Longquan kilns during the Southern Song period. Renowned ceramics specialist Professor Zhu Boqian has suggested that the Longquan kilns began to make crackled wares around 1200 in imitation of the Southern Song crackled Guan wares made at the Jiaotanxia kilns, near Hangzhou. (Rosemary Scott, "Guan or Ge Ware: A Re-Examination of Some Pieces in the Percival David Foundation", Oriental Art, Summer 1993, vol. 39, no. 2, p. 19.) According to excavation reports, places where these Longquan wares in Guan style were made include Xinting, Aodi, and Shanshu Lianshan in Dayao County and Wayaoqing, Kulouwan, and Lijiashan in Xikou County. See Sung Guan Yao Te Zhan (Catalogue of the Special Exhibition of Sung Dynasty Kuan Ware), National Palace Museum, Taipei, 1989, p. 30. Guan-type wares produced at the Longquan kilns show considerable variation, some pieces exhibiting the dark, slate-grey bodies and crackled, greyish-blue glazes characteristic of the finest works made at the Guan kilns, while others merely imitate the form of Guan pieces but claim the light grey stoneware bodies typical of standard Longquan celadon ware. The most difficult to categorize are those Longquan pieces with a golden-brown glaze, such as the present tripod censer, as it is uncertain whether the glaze is golden brown by intention or simply by accident of exposure to an oxidizing atmosphere within the kiln at the beginning of the cooling cycle. A few Guan vessels boast crackled, greyish-blue glazes with undercurrents of pale, café-au-lait brown, as exemplified by a cuspidor in the collection of the National Palace Museum, Taipei, which the curators there attribute to the Southern Song period and to the Jiaotanxia kilns; alas, it remains unclear whether the brownish cast is the result of exposure to an oxidizing atmosphere during firing or to a stain spreading outward between glaze and body from the brown veins within the craquelure. See Sung Guan Yao Te Zhan (Catalogue of the Special Exhibition of Sung Dynasty Kuan Ware), National Palace Museum, Taipei, 1989, no. 42. That both the slight ridge that distinguishes neck from shoulder and the vertical ribs that embellish the legs are brown, rather than white - as they are on similarly shaped Longquan liding-form censers with classic bluish-green glaze - suggests that this piece was intended from the beginning to have a golden-brown glaze, as does the even, homogeneous hue of that golden-brown glaze. If so, the body, or at least those areas where the glaze was expected to run thin during firing, might have been dressed with an iron-oxide-bearding slip before the glaze slurry was applied, causing the vertical ribs on the legs and the slight ridge at the base of the neck to appear brown. 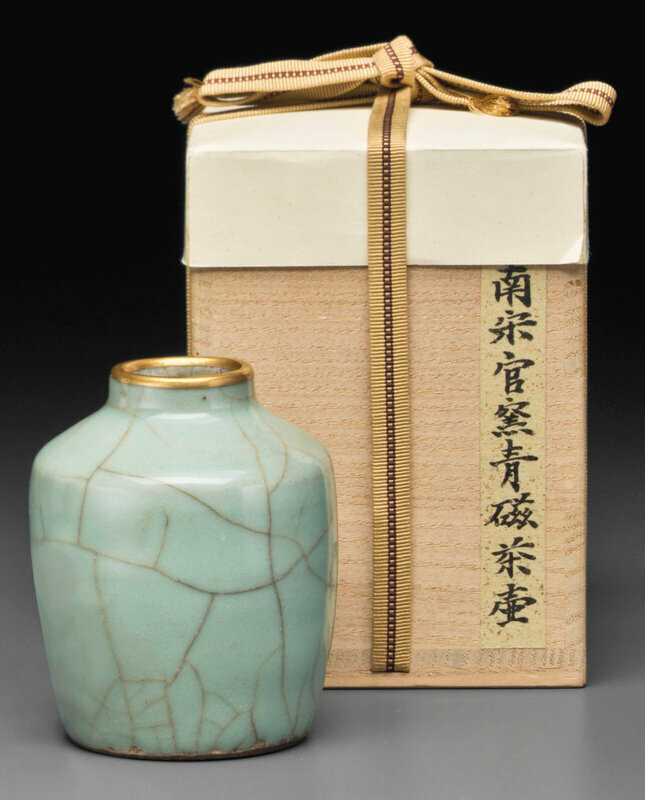 A censer of related form with crackled, brownish-hued glaze was sold at Sotheby's Hong Kong, 14 November 1989, lot 9. A Longquan long-necked bottle and a bowl with vertical side walls, each with golden-brown glaze and attributed to the Southern Song period, are illustrated in Longquan Yao Qing Ci (Celadons from Longquan Kilns), Taipei, 1998, p. 139, pl. 106, and p. 170, pls. 141-1 and 141-2, respectively. Finally, a tripod incense burner with delicately cusped body, upright S-curved handles, mock-ring embellishments, and a golden-brown glaze in the collection of the Metropolitan Museum of Art, New York, is attributed to the Song dynasty (960-1279) and has been identified as Guan-type ware (accession number 17.118.27a,b). 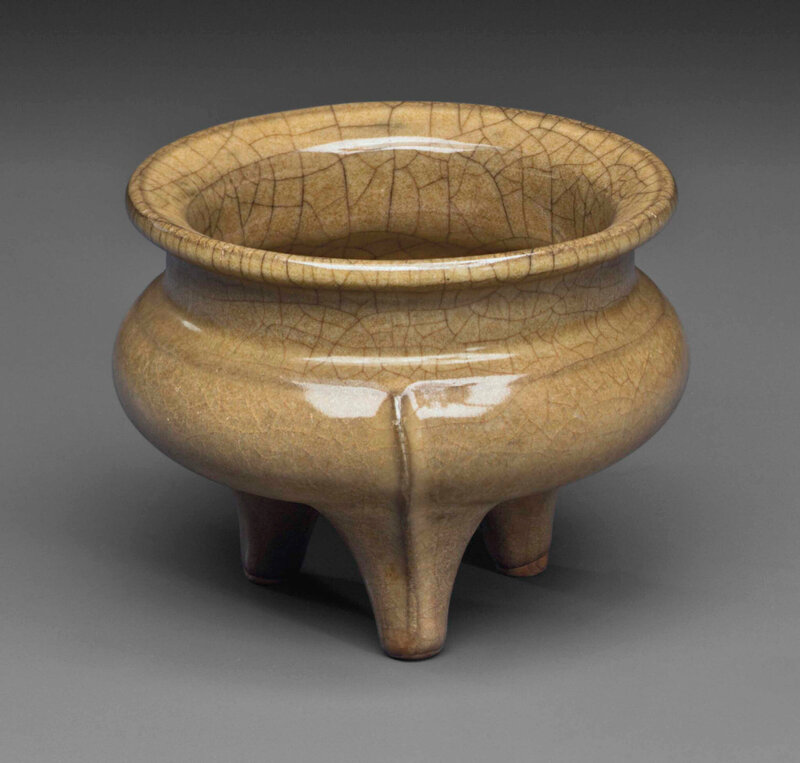 If the Metropolitan Museum censer truly is Guan ware, dates to the Song dynasty, and fired to the intended color, perhaps its glaze can be cited as aesthetic inspiration for the golden-brown glaze of the present censer.